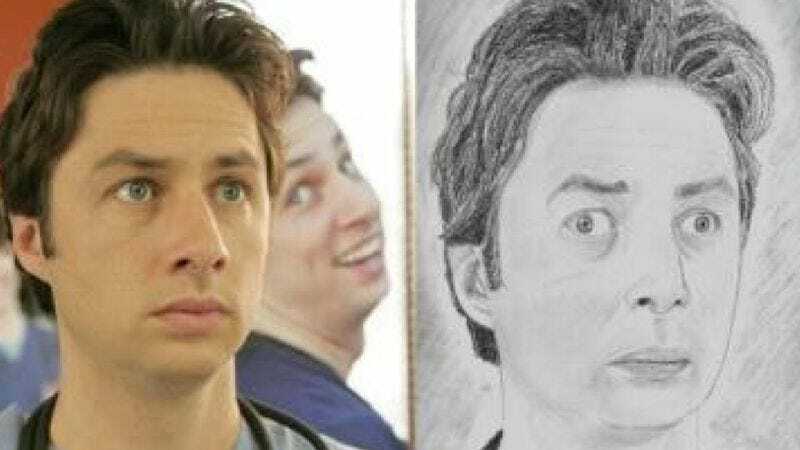 A walleyed Zach Braff. An elongated Rihanna. A sharp, angular Lady Gaga. These are the kinds of aesthetically and anatomically dubious renderings that only truly devoted fans could create in misguided tribute to their pop-culture heroes. Examples of bad fan art have long been an internet obsession, and Imgur user shynodaluvor08 has curated a very amusing little gallery of them. Here, the fan-created works are juxtaposed with actual photos of the celebrities themselves to highlight the differences between them, should those differences not be intuitively obvious. Also included are nightmare-inducing, heavily Photoshopped pictures of those same celebrities, with their facial features rudely rearranged so as to better match the fan art. Daniel Radcliffe doesn’t have crazily piercing eyes and a rat’s nest of hair piled high on his head? Well, he does now. Speaking of eyes, few could top the silver-dollar-sized orbs that one fan has given to a demonic, grinning Mel Gibson. Former Wham! singer George Michael, meanwhile, has been given an innocent, almost doll-like appearance, only slightly undermined by his skeevy facial hair. The entire gallery is embedded below for those whose appetite for the grotesque has not yet been sated.